division that produces parts for fighter-jet turbine engines. The contract stamper’s three facilities, each with approximately 70,000 sq. ft. and totaling approximately $75 million in combined annual sales, have operated several large- to medium-tonnage press lines, including reportedly the world’s largest two-point eccentric-shaft press—a Minster E2 1600-ton monster. Schaller’s niche: producing deep-drawn extrusions from coil stock processed in progressive die-operations, and threaded parts without weldnuts, designed to meet downstream assembly requirements. Another niche is found in larger automotive panels and assemblies due to the continued drive by end users to eliminate the number of parts required for assembly. The company stamps as few as 1500 or as many as 350,000 parts on a single run. All of the firm’s success requires exceptional performance in stamping-lubrication delivery and containment, and conveyance of parts and scrap, according to Arv Pikunas, Schaller plant manager. For example, he notes the company’s drastic change in its press-line lubrication systems, from die flooding to directed spray lubrication. To do that, Schaller acquired 11 lubrication lines from Pax Products, Celina, OH, including two units on the 1600-ton press. The lines direct lubricant to the manifold under pressure and provide a constant and consistent supply. As long as the system’s reservoir has lubricant, that lubricant will als be available at the distribution valves. Since the amount of lube needed, and where its needed for the job, varies with each die, the lube system allows for flexibility. This press at contract stamper Schaller Corp. employs a lubricant delivery system (foreground) that sprays directly on the strip in various locations in a progressive die. Previously, the company flooded dies with lubricant, a costly and messy process. Of course, with spraying, customers receive parts with less lubricant on them —in most cases just a fine film. At Schaller, an initiative has given the same importance to production, quality and housekeeping. In addressing housekeeping, the company seeks to eliminate clutter on the floor and keep only absolutely necessary equipment at the stations. With lubrication, housekeeping means keeping it contained as best as possible. In flooding dies, employees constantly spent time mopping lubricant off of the shop floor. “This results in operators unable to spend time checking parts or returning a press to production,” notes Pikunas. “With spraying, we dial in exactly how much we want to spray within the 360-deg. pitch of the stroke of the die. We control the amount of lube used on the strip and the die, so lube does not hit the floor. The spray operation results in virtually no housekeeping issues. “We’re trying to create an atmosphere in the company that allows employees to focus on the production job at hand,” he continues. “They can monitor what’s in the press and what part is exiting the die, and determining if that part is a quality part. At the end of the day, our operators want to make parts, not mop floors.The company reports that it saves tens of thousands of dollars annually on lubrication costs due to the switch from flooding to direct-spray application, and has realized its target of an 18-month-or-less return on investment. 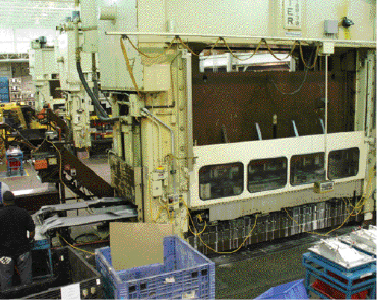 This Minster 1600-ton unit, reportedly the world’s largest two-point eccentric-shaft press, employs die doors to assist in lubrication containment and protect workers should a malfunction cause parts or scrap to fly out of the die. Assisting in lube containment are Pax die doors integrated into press shields as well as a system to handle lubricant mist. Because of the tremendous amount of heat generated during stamping, steam is produced when the water-soluble lubricant hits the hot progressive tooling. The steam acts as a lubricant carrier, necessitating a method to contain it, especially in situations where a component such as a conveyor exiting the press results in an open press window. To combat that, Schaller has incorporated a filtering exhaust system, also from Pax Products. Every press at Schaller incorporates die doors. The company had experimented with many different doors—homemade and purchased—trying to find doors best able to contain lubrication and protect employees. The doors from Pax have done that, says Pikunas, and their light weight has provided ease of use. 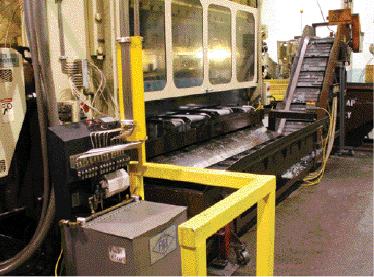 Schaller Corp. switched to low-profile conveyors such as these, bringing better control of part and scrap removal. An added benefit: The conveyors last much longer than expected in the hostile stamping environment. Note the lubricant runoff below the conveyors. Schaller captures and reclaims its lubricant, bringing a host of cost and safety benefits. In addition, the doors provide safer press operation. Additionally, the company uses Pax spray cabinets to apply lubricant to the material before it enters the die. With the cabinet—an enclosure mounting to the feeder and extending through the press window on the entry side—built-in spray nozzles coat material top and bottom, before the material enters the die. Any lubricant captured in the enclosure can be returned to the lube system or to a pit to facilitate recycling. “By placing a light coat on the coil, we are less likely to have issues related to strip not being lubricated as it traverses the die,” says Pikunas. 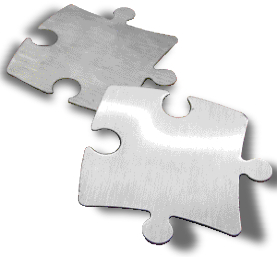 Another press improvement at Schaller revolves around part and scrap removal. Low-profile conveyors, again from Pax, helped provide the connectivity Schaller needed. 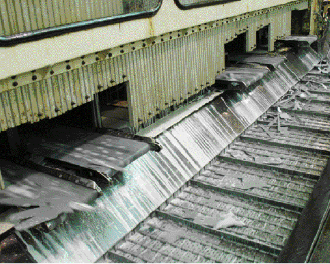 The conveyors also have exhibited long life in the harsh stamping environment, according to Pikunas. Preventive maintenance (PM) at Schaller helps add to conveyor life. Information for this article provided by Pax Products, Inc., Celina, OH. Tel. 800/733-6930; http://www.paxproducts.com/. See also: Nidec Minster Corporation, Pax Products, Inc.